Emerging Godolphin star Old Persian achieved first G1 success in the Dubai Sheema Classic on Dubai World Cup night, Saturday, 30 March, at Meydan, UAE. The four-year-old Dubawi colt stayed on gamely to win the 12-furlong turf contest and provide trainer Charlie Appleby and jockey William Buick with a memorable treble on the world’s richest raceday. Old Persian, successful on his seasonal debut over the same course and distance in the G2 Dubai City Of Gold on Super Saturday, 9 March, tracked the leaders as a close fourth of the eight runners. He moved up to third with five furlongs to race and was angled out by William Buick at the top of the straight to deliver his challenge. Old Persian quickened well to hit the front with a furlong and a half to race and soon opened up a clear advantage over his rivals, finding plenty in front to see off the late challenges of Cheval Grand and Suave Richard by a length and a half and a half-length in 2m 27.17s on good turf, not far off the course record. The first three finished well clear of the others. His Highness Sheikh Mohammed commented: “Every one of Godolphin’s winners tonight have made me happy, but we are winners with this gathering tonight. To bring everybody together – the horses, the owners and the trainers from around the world. “We are trying to find more horses now. Our winners tonight are well-known, but we are trying to find the new horses now. 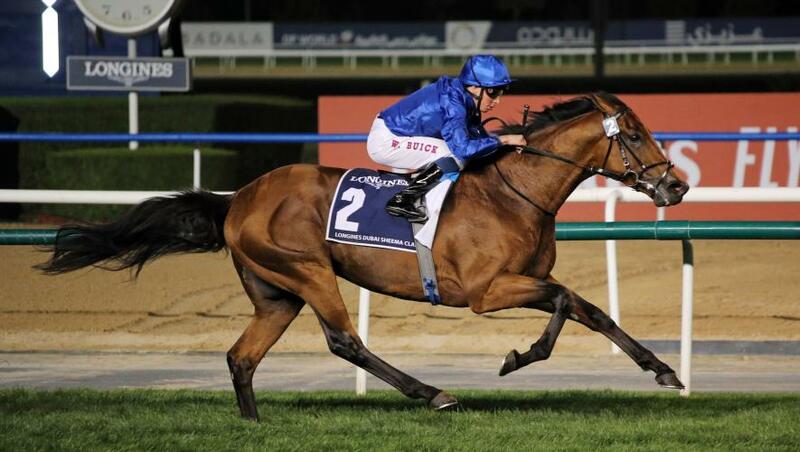 Charlie Appleby added: “I was pleased with the way the field went a good, sensible gallop this evening. Turning for home, William made a very decisive move to make sure he got his gap, which allowed himself to get the run that he needed. “Once he did that, I knew that the acceleration that he showed in the Dubai City Of Gold would be there again. He a typical Dubawi in that he has shown the progression from three to four. “It has been a fantastic evening for myself, Godolphin and, more importantly, His Highness Sheikh Mohammed. He has given us all the confidence in the world to allow us to do what we need to and hopefully the results are showing. William Buick commented: “I am in a very privileged position and all four of my Dubai Sheema Classic winners have been fantastically good horses. Each of them means something special to me. “To come here tonight with the book of rides I had – it’s great when it comes off. “We had a good position in this race. Christophe Soumillon slackened the pace on the front halfway down the back on Rey De Oro and it was a tactical thing, but Old Persian has so much pace.